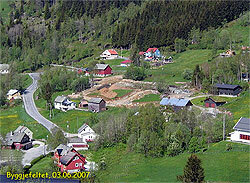 Myrkdalen is a small valley in the municipality of Voss with approximately 240 inhabitants. Myrkdalen lies about 30 km from the centre of the municipality, Vossevangen, and a two-hour-drive from Bergen. Myrkdalen is situated between the Hardangerfjord in the south and the Sognefjord in the north, in other words right in the heart of Fjord Norway. The gateway to Myrkdalen is Lake Myrkdalen (Myrkdalsvatnet) in the south and Vik Mountain (Vikafjellet) in the north. Next to these there is a housing area with vacant sites for houses. 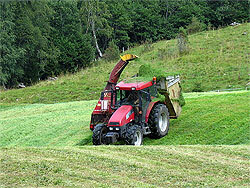 Agriculture is the main industry in Myrkdalen and characterizes the beautiful cultivated landscape. 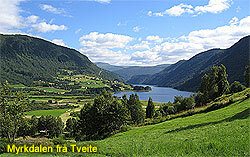 The countryside of Myrkdalen is particularly pretty and can be used in the summer as well as in the wintertime. In the winter there is always a lot of snow in Myrkdalen. In our valley there are downhill and slalom slopes and a floodlit cross country track and vast mountain areas for those who prefer that kind of experience. Summer and autumn is the time for hunting, fishing and hikes in this great countryside of Western Norway. Myrkdalen has long traditions for woodcarving, arts and crafts. Since 2002 a ski resort has been built here. It comprises downhill and slalom slopes as well as a hotel and lot of cabins. The ski resort is graduially develloping. There are plans for 3400 units (cabins, flats, and rooms). This enterprie is a supplement to farming and traditional activities in our valley. People in our valley, young or old, need not have problems spending their spare time. The countryside in and around Myrkdalen can be used for activities all seasons of the year. It is possible to take trips summer and winter, for instance to the summer farms, which are situated not so far from the valley itself, or to the surrounding mountain areas. Most of the lakes have plenty of fish, and hunting deer and reindeer is possible for those who are allowed this sort of activity. Årmotslia skisenter offers activities for those who are interested in cross country skiing or biathlon. Myrkdalen Fjellheisar (ski lifts) is ideal for those who prefer down hill skiing, and in Nyestølsbakken one can practise ski jumping. 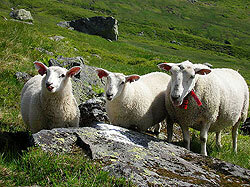 The traditional occupation in Myrkdalen has been and still is agriculture. But times change, and in the same way industry and business change. Other important occupations are tourism, service, rental of cabins, arts and craft, centre for horse riding, camping summer and winter, transport, and construction work. Myrkdalen is renowned for woodcarving, and arts and crafts. Styrk Hirth, Styrkår Hirth, and Sjur Mørkve are well known for their work. Today there are two companies with this kind of production, Treskjerartunet and Myrkdalen Tredesign. Tourism is the fastest growing industry in Myrkdalen because of the establishment of the cabin area and the ski lifts that has been built. 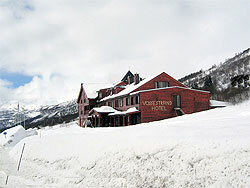 Vossestrand Hotel has been rebuilt and has extended its business. Farmers and others hire out flats, cabins, and houses. In Myrkdalen one can also stay over night or have a longer stays at Vossestrand Hotel, Helgatun, Myrkdalen Hotel, Myrkdalen Fjellandsby, and Skjervheimstunet. Myrkdalen Fjellheisar runs the ski slopes which are gradually extended year by year. There are also plans for expanding the cabin area even more. Part of the economic life is naturally associated with agriculture.Myrkdalen Hestesenter for instance runs a riding centre and a farm with activities for young and the not so young. Others are occupied with clearing snow in the winter, and others offer services for cabin owners combined with farming. In Myrkdalen it is possible to make and develop things for those who want to. It is up to those who live here and hopefully new inhabitants to shape and develop the valley in a desirable way. A housing area with vacant sites is available. The price for a site is 320.000 Nkr. The sites vary in size from 1000 m2 to 1500 m2. Four of the sites are already sold. The sites will be sold for house construction only, and not cabins or holiday homes. For further information, please contact Kjetil Skjervheim.